Within the Royal Canadian Legion, the various branches have the possibility of deploying a so-called Colour Party. 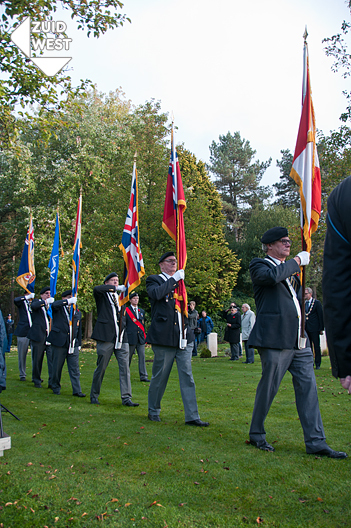 Royal Canadian Legion Branch 005; “The Liberation of the Netherlands”, is also able to assemble such a Colour Party from its members. The Colour Party can act in its established role at those occasions where the Royal Canadian Legion is to be represented. These occasions are carefully defined and criteria are in force as to the correct deployment of the Colour Party. (Re) Funeral of Canadian soldiers and/or Canadian veterans in Netherlands. Parades in which Canadian soldiers and/or Canadian Veterans participate. At the request of the Canadian Embassy. The Colour Party (flags) is mostly present at memorial services. The Colour Party may differ in its “flag-presence ‘. Any additional flags or banners, depending on the memorial.